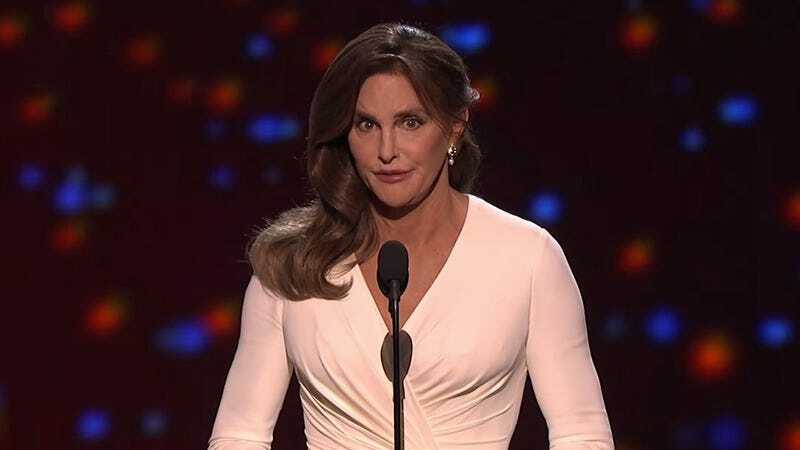 Olympian Caitlyn Jenner was honored with the Arthur Ashe Courage Award at the ESPY Awards ceremony, hosted by Joel McHale, in Los Angeles last night. The award is given annually to an individual whose contributions “transcend sports”; this year’s award was presented to Jenner by Abby Wambach of the U.S. women’s national soccer team. “Now though, there’s a new story,” Wambach continued. “A story of someone whose mission isn’t to bring attention to herself but the ones who truly need it.” The crowd at the awards ceremony all stood as Jenner was called to the stage. A lot of the responses to how Jenner looked and what she was wearing last night—one of the first details in the ABC News story about Jenner’s award is about what she wore, and even Wambach noted Jenner’s beauty when bringing the athlete to the stage—stir up some of the same sentiments in Cox’s response to Jenner’s Vanity Fair cover, which she posted on her personal Tumblr. In her response, Cox urged people to move beyond conversations about physical appearance and beauty, asking us to consider privilege and access when commenting on beauty standards. Jenner’s family attended the event last night, and as usual with Caitlyn’s children, they took plenty of selfies to document the evening. Kendall, Kylie, Brody, Burt, Brandon, and Leah Jenner, along with Cassandra Marino, and Kourtney, Kim, and Khloe Kardashian were all in attendance to support Caitlyn. Kourtney posted a photo of the family together backstage, and Brody told ABC News that they would all be celebrating with a big family dinner.